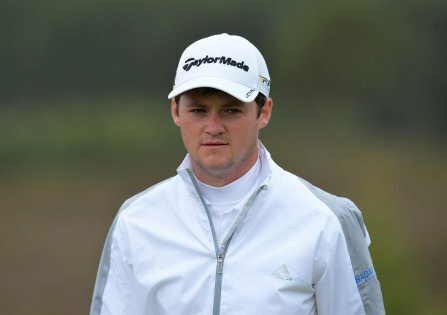 It was the Rathmore man’s lowest round of his fledgling career in the professional ranks and good enough for joint top spot with another former British Amateur champion, the Korean Byeong-hun An, who had nine birdies in a bogey free effort. Dunbar got off to a poor start after teeing off at the 11th, bogeying his opening two holes, but that did not deter him as he fired 11 birdies to smash the course record almost exactly a year after his biggest win as an amateur. “I was in just the zone,” said Dunbar, whose Amateur Championship win came at Royal Troon in Scotland. “I’ve been playing well all year now, shooting good scores but missing the cut by a couple of shots. It’s good to put it all together and have a strong round. Barely 30 minutes after Dunbar came in with that record-breaking score, US-based An also signed for a 62. In contrast to Dunbar, An did not card a single bogey as he shot nine birdies on the way to his lowest round as a professional. “I really like this course but it’s actually fairly hard,” said the 21 year old. “There are some hard holes. It is pretty long and gets pretty tough if you don’t drive it very well. I missed the cut last year but this year I guess it suits me better. 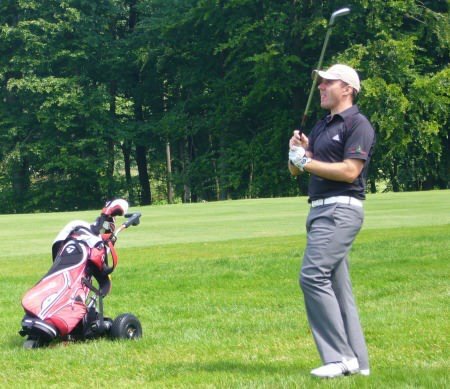 Spaniard Sebi Garcia was a shot back after carding an eight under par 63 while there were seven players three shots further back on six under par, including former Challenge Tour Grand Final winner Andrea Pavan and local favourite Duncan Stewart, who lives just 15 minutes from this week’s venue. Colm Moriarty made a positive return to the tour after an eight-month absence, carding a two under 69 to share 47th place with Portstewart’s Paul Cutler and Challenge Tour regular Gareth Shaw. Niall Kearney’s 70 leaves him with work to do to make the halfway cut while Douglas’ Peter O’Keeffe may need at least a 66 after making two double bogeys in a three over 74. Neither of them had football legend Johan Cruyff on their bag but Alan Dunbar and Ruaidhri McGee got their Challenge Tour seasons off to the perfect start when they opened with five under 66s in the Challenge de Catalunya. 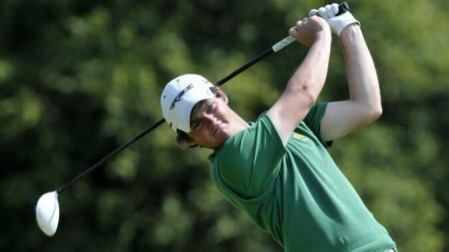 Alan Dunbar began his professional career with a four under 68 in Madrid. Amateur Champion Alan Dunbar got his professional career off to a rip-roaring start with eight birdies - including three in his last four holes - at the Challenge de Madrid. Byeong-hun An shares the lead in the Scottish Hyrdo Challenge. Picture © Getty ImagesWhen you shoot 75 on the Challenge Tour, you can expect to get trampled in the stampede.